Do your kids need help staying organized and knowing when to do their chores? Mine sure did! Even though the kids had the Editable Chore Cards for Kids to tell them how to do the chore, they were still needing guidance on when to complete their chores. To help them out, I made an Editable Chore Chart for Kids to help them know their chore schedule. 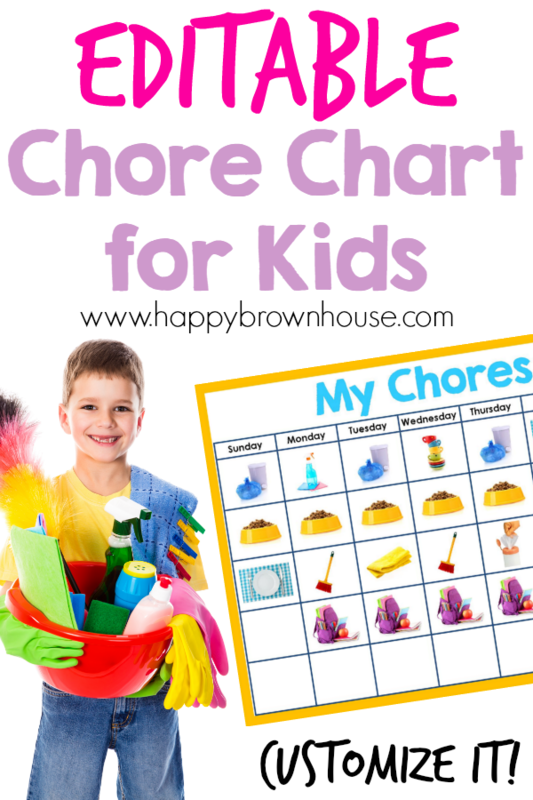 This Editable Chore Chart for Kids was designed to be a companion product to the Editable Chore Cards for Kids. After the popularity of the chore cards, I knew I needed to take that product and expand on it. Plus, I really needed to get my kids organized. The chore cards weren’t enough for them on their own. The great thing about this chore chart is that you can get your kids on a schedule. 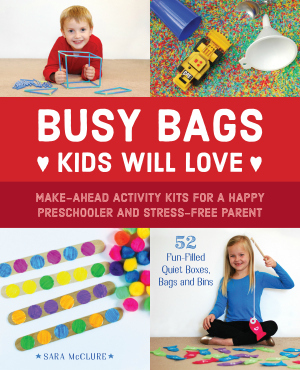 It’s easy to set up and will have your kids organized in no time. To make it, you simply print, laminate, add velcro, and hang it up. You’ll have to talk to your kids about how to use it, but it is really pretty simple to use. All of the chore chart pieces have the same pictures as the Editable Chore Cards for Kids. This is why they work so well together. 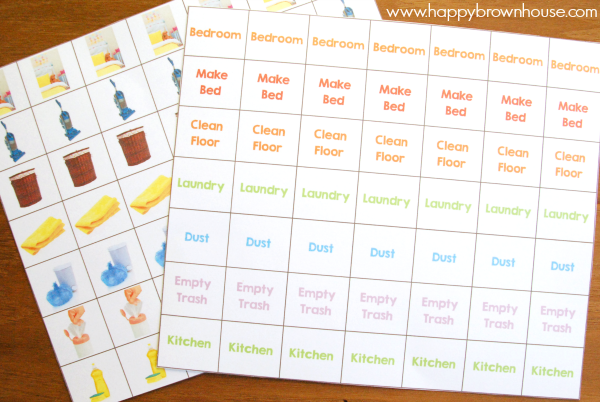 Kids will be able to look at the chore chart picture, find the corresponding chore card with step-by-step instructions, and get to work. Or, if your child is old enough to read, there is a set with words on them. These are the same chores that are on the Editable Chore Cards for Kids. There are a total of 19 picture cards (I removed duplicates from the chore cards) and 28 word cards for the chore chart. I’ve even included a few self-care tasks like getting dressed, brushing teeth, and doing homework. 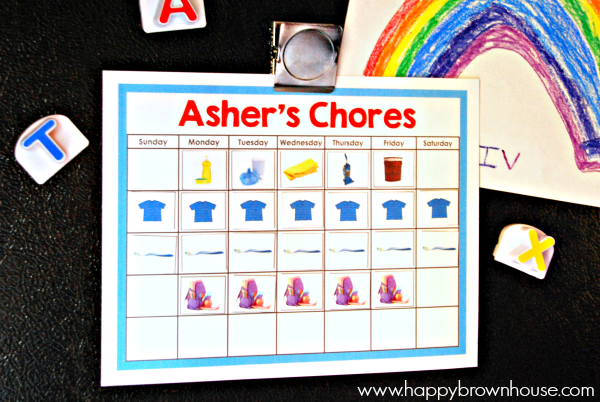 The chore chart picture cards are great for little kids that can’t read, but they’re also really good for kids with special needs. I’ve used real-life pictures instead of clip-art so the kids will, hopefully, have an easier time identifying their chore and the tools needed to complete it. These pictures are the same pictures on the Editable Chore Cards for Kids. I’ve included several color options for the chore chart so your kids can pick out their favorite. You simply click in the blue edit box and type their name. It’s so easy! There are also edit boxes for you to type in your own chores that are unique to your family. The possibilities are endless! 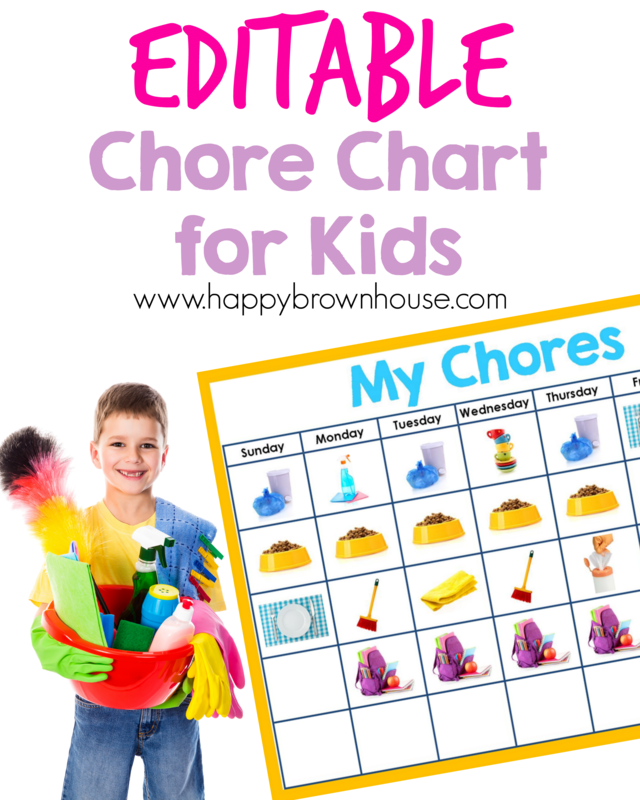 I’ve been using the Editable Chore Chart for Kids in my own home for a while now and it has made chore time so much better. The kids aren’t asking me what to do next because it is on the chart. This frees me up to tackle my own chores. With the chore cards and the chore chart working in tandem, it makes chore time a breeze! It is my hope that these are a real blessing to you and your kids. You can purchase the Editable Chore Chart for Kids by itself or you can buy the Chore Bundle that includes the chore cards and the chore chart. Obviously, you save a little more when buying the bundle. Want the chore chart? Grab it in the shop! Still not sure? Scroll to the bottom and get a sneak peek.